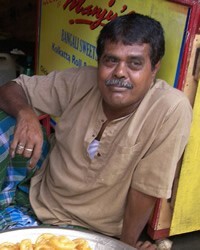 The Halwai are a caste of sweet makers and confectioners. The name Halwai comes from the Hindi word "Halwa" which is a sweet. They have respect in Hindu communities. Because of the importance sweets have in religion and socially, they have a special position in festivals and childbirths and marriages. 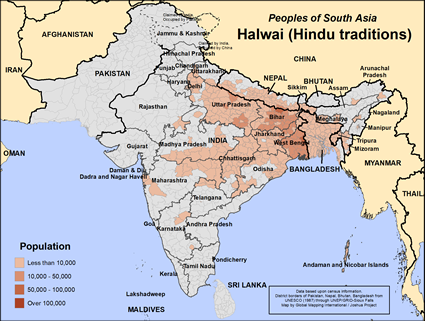 The Halwai live mainly in India's northern states, but they also live further east in Bangladesh, a Muslim country. Most of the Halwai are comfortable financially and some are wealthy, particularly in the cities and towns. Halwai owned sweetshops are located in the towns and bazaars of north India and Bangladesh. Some of the Halwai do government and private work. Some work in agriculture. There are a few doctors and engineers among them. They are mainly vegetarians, eating wheat, rice, fruit, and vegetables. They like milk and dairy produce but not alcohol. They educate both boys and girls. The Halwai are endogamous, which means they do not marry outside of the group. They believe in monogamy, so marriage is between one man and one woman. They permit divorce, and divorcees and the bereaved can marry again. The bride's family must give the groom's family a dowry. Property is given equally to the sons, though the oldest son has the highest status in the home. Younger men often move away to begin a business. The Halwai are mainly Hindu and worship all the main Hindu gods such as Shiva, Rama, Krishna, and Ganesh. A Brahmin priest does birth, marriage, and death ceremonies for them. When a Halwai person dies their body is cremated and the ashes are immersed in a river with the Ganges being the favorite. They observe post delivery childbirth pollution and death pollution for a given period of time. They do Hindu pilgrimages. The Halwai celebrate all the main Hindu festivals such as Holi and Diwali, many of which involve giving and eating sweets—which is very good for business! * Pray that the risen Christ will reveal Himself to the Halwai people this year during their festivals so that many will put their faith in Him rather than in Hindu gods. Ask the Holy Spirit to show them their need for the holiness available only through Christ. * Pray for a church planting movement among the Halwai people in Bangladesh and India. * Pray for the Lord to raise up hundreds of Halwai people who will give up their wealth and prestige to follow the King of kings. View Halwai (Hindu traditions) in all countries.